Evangelistic-lutheran parish was founded in Ruskeala in 1727. The wooden church for 800 seats was built by the project of architect Anders Fredrik Granstedt in 1834. Project was approved by Johan Carl Ludvig Engel. In March 1940, as result of the Winter War, the all territory of Ruskeala became Soviet. A building of the old church burnt July 17, 1940. Ruskeala former church bell, which was cast in Stockholm in 1750, is located now in the Lutheran Church Viinijärvi (Parish Liperi). On the place where the church stood there is now a memorial stone which reads "At this place stood Ruskeala church, built in 1834 and burned in 1940. Faith, hope and love, do not disappear." Lutheran parish in Ruskeala was resumed in 1990. In the same year was founded the Ruskealan Pappila Oy, which restored the stone building of former parsonage (built in 1931). In April 1993, Ruskeala parsonage was opened for tourism purposes. The building also used for church services. The lease of the building expired in 2004. 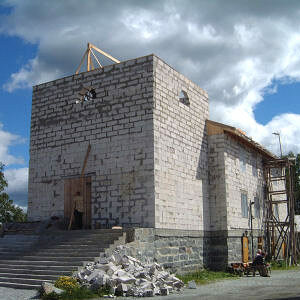 In 2002 on the initiative of Kalevi Keinonen began the construction of a new church. At the end of 2004 the church basement was completely prepared for use. There is a kitchen, dining room, fireplace hall, sauna, hotel rooms, as well as the hall for church services. April 17, 2010, the church was blessed by Ingria Evangelistic-lutheran Church bishop Aarre Kuukauppi. March 18, 2013, the church badly damaged in the fire. September 25, 2016, the church was blessed anew by Ingria Evangelistic-lutheran Church bishop Aarre Kuukauppi.